One of the greatest advantages to home based therapy is using toys and equipment in the child’s natural environment to create a plan for success. That Fisher-Price activity center can be used for much more than entertainment for your child; your Physical Therapist can use it to promote standing and coordination, your Occupational Therapist can use it to help with fine motor skills like pressing the buttons or turning knobs to make it work, and your Speech Therapist can help with language by discussing what colors and objects are on the activity center. Therapy can be incorporated into many activities throughout your child’s day and it doesn’t have to feel like work for either of you! 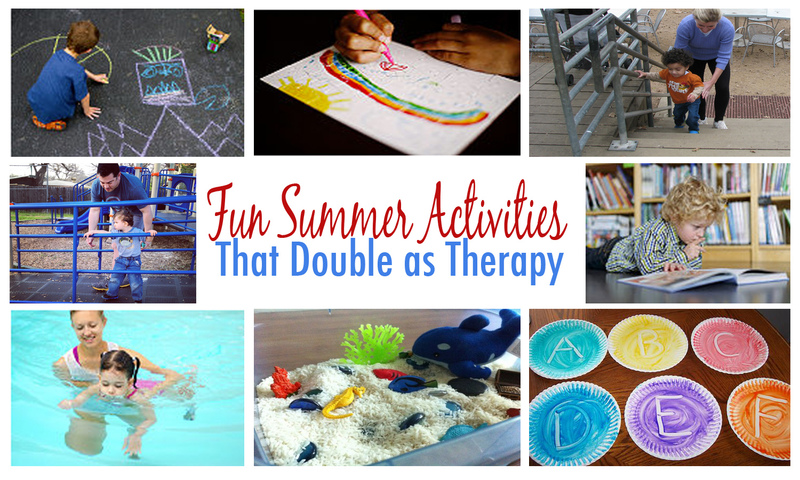 We’ve asked our therapists to help us come up with some fun activities to get you through summer that keep your children entertained, but also help with therapy goals. It’s much easier than you think and doesn’t take any formal training. These activities are great for anyone to supplement private therapy over the summer, for those who may be taking a break from formal therapy this summer, or even for you to try on vacation. Our PTs, Laurie Brophy and Doug Levine, both recommend visiting the local park (in the morning or early evening to avoid the heat) for improving bilateral coordination. Helping your child move from one apparatus to the next and working on climbing can be very helpful. Swinging is good for improving arm strength, abdominal strength, and can calm the vestibular system. The park can be used in a variety of ways to help work on different therapy goals such as pulling to stand, cruising along ramps, and reaching across midline to manipulate levers and knobs. There are also a few adaptive playgrounds around town with equipment for children of all abilities, including wheelchair swings! If you have a park nearby, you can always ask your therapist to meet you there and have a PT session at the park! 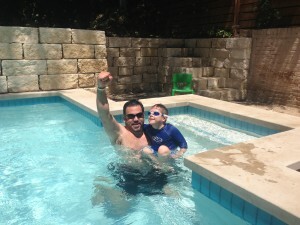 Swimming is also highly recommended over the summer. For one, it’s a great way to stay cool, but it is also very beneficial for therapy. The unique properties of water allow for greater buoyancy and reduce body weight, which allows for greater range of motion and can reduce discomfort of certain positions. Water can also provide resistance that is beneficial for gross motor skills like walking. There are a variety of exercises that can be done in the pool to help restore function and calm the body. Many of our therapists are also trained in providing Aquatic Therapy. If you have access to a pool, discuss the possibility of adding Aquatic Therapy to your Physical Therapy plan this summer. Your trip to the grocery store could also be good for a sensory rich experience and therapy goals. Have your child reach, bend, and stoop to help get items off the shelves. While no one likes to think about school over the summer, it is still important to work on things like reading and handwriting in preparation for the next school year. Handwriting work doesn’t have to simply be grabbing a pencil and lined paper to work on drills. Our OT, LeAnn Pigulski, recommends using Handwriting Without Tears Methods for working on penmanship. Try practicing handwriting by writing letters in the sand, forming letters in water (pool, ocean, water sensory table), forming letters in bins of rice, fingerpainting letters, forming letters whip cream or shaving cream, the possibilities are endless. Going outside with sidewalk chalk is also a good idea for drawing, writing, and playing games like hopscotch. These help with fine motor skills, motor planning, and coordination. Another OT, Willow Dea, states setting up learning stations at home can be another great way to incorporate therapy and also keep the “school routine” going at home. Encouraging movement through three or four stations a day can be enough to keep your child used to the routine of school, but also helps with motor planning. Possible stations for fine motor activities could be: Picking up coloring books or printing pictures from the internet of your child’s favorite characters and encouraging them to trace or try and draw pictures free hand. Take a trip to Half Price Books and set up a reading station. Writing stations to practice writing letters to friends or making cards for friends would also be good for your child. Arts and crafts are always good practice for fine motor and visual motor skills. You can create crafts from household objects or pick up some kits from Target. The dollar spot always has puzzles, painting kits, and other fun activities. Gross Motor stations are also important to include and could be something like setting up an obstacle course using basic toys such as a hula-hoop, pillows, blanket, soccer ball and/or an indoor trampoline. Work with your child to create challenges like doing a certain number of jumps, squats, crawling under objects, rolling over, tossing, kicking, balancing, squeezing and then finishing the course. Drawing the steps out can help children who have trouble with sequences and motor planning. Start with 3 or 4 steps and then increase as your child can handle. Jumping rope, swings and slides are also great! Large therapy balls are good for seated balance or full on exercise based games for increasing shoulder stability or postural stability. Sensory Bins are always popular for working with different textures and help with visual stimulation/processing and can also help language. Simply take a Tupperware bin or box and fill it with rice and then add small items for your child to find. Ocean themes are great for summer, find small toys like fish, ocean animals, seashells and have your child find them in the rice. 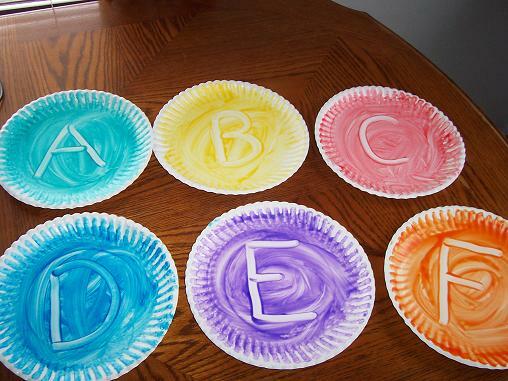 You can also use water with a few drops of food coloring. 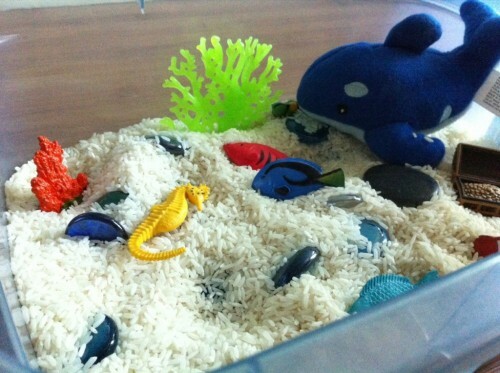 Sand is another option for sensory bins. There are many ways to include speech and language development throughout the day. Simply talking about activities and asking open-ended questions help to encourage language. If you are taking a road trip this summer, our SLP Meghan Gale recommends playing I Spy on long car rides to help build vocabulary and grammar skills. The Alphabet game is also good for recognizing letters, words and sounds. Start with the letter ‘A’ and ask your child to find a word that starts with ‘A’ by looking at road signs, billboards, license plates, and businesses. Move through the alphabet until you get to Z, some of the letters are trickier than you think. This will keep them busy on long trips, but also helps build language and encourages visual scanning and processing. 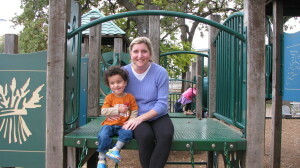 Another SLP, Jayme Ferguson, recommends playing Flashlight Hide and Seek outdoors. Tape pictures of vocabulary words or words with target sounds in them to the trees, fences, patio furniture and then use a flashlight to find the pictures. When the child finds the correct word or sound, you can prompt them to put the word in a sentence, practice the target sound, or tell a story using the target word. You could do the same thing indoors, but getting outside when it’s cool in the evening can be a lot more fun. Therapy doesn’t have to be all hard work. Talk with your therapists about other fun ideas you can easily incorporate to your daily routine. Growing Places Therapy Services, PLLC is a pediatric therapy practice providing physical, occupational, and speech therapies to children from 0-21 years in the Greater Austin area. Our mission is to help your child grow to reach his or her full potential. Tagged summer fun, therapy tips. Bookmark the permalink. Subscribe here to receive updates directly to your e-mail! Growing Places Therapy | Powered by Mantra & WordPress.